GeorgeWythe is a Legacy Library. Legacy libraries are the personal libraries of famous readers, entered by LibraryThing members from the Legacy Libraries group. » George Wythe's legacy profile. GeorgeWythe is also an author. » See George Wythe's author page. About meGeorge Wythe (1726 - 8 June 1806), Virginia lawyer, educator, judge and statesman. Educated by his mother and briefly at the College of William and Mary, Wythe studied law with Stephen Dewey and was admitted to the bar at age 20 in 1746. Named attorney general of Virginia in 1753, Wythe later served in the House of Burgesses 1755-1775, representing Williamsburg, the College of William and Mary, and Elizabeth City County. 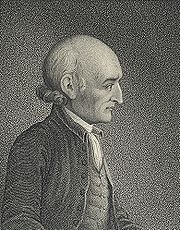 Elected a representative to the Second Continental Congress, Wythe served until 1777, in which capacity he supported and signed the Declaration of Independence. Returning to Virginia, Wythe was elected Speaker of the House of Delegates, and worked to draw up the Virginia constitution, overhaul the laws of the state, and design the state seal. In 1779 he became professor of law at the College of William and Mary (making him the first official law professor in America), formalizing his role as a prominent educator (his students included Thomas Jefferson, John Marshall and Henry Clay). Wythe was named a delegate to the Constitutional Convention in 1787, but left Philadelphia early due to his wife's final illness. In 1789 Wythe was named judge of Virginia's Court of Chancery; he moved to Richmond in 1791 and lived there for the remainder of his life. Wythe was poisoned by a grandnephew in late May, 1806 and died on 8 June after an agonizing illness. About my libraryWythe bequeathed his extensive library of law, classics and other books to Thomas Jefferson, a longtime friend who was serving as president when Wythe died in 1806. In November 2008, a list of the books Jefferson received from Wythe's estate was identified among the Coolidge Collection of Thomas Jefferson Manuscripts at the Massachusetts Historical Society. A transcription of that list, by Monticello's Endrina Tay and MHS' Jeremy Dibbell, is available here, and digital images of the list are available here. Jefferson parceled some of Wythe's books out to various relatives and acquaintances (List, pp. 1-5), keeping a portion of them for himself (List, pp. 6-8). Many of these were later sold to Congress with Jefferson's library in 1815. This LT catalog has been created using Jefferson's list of Wythe books, with additional books drawn from other Wythe correspondence, invoices and orders. Where possible we have provided additional information about each title, including how Jefferson disposed of the book and information about the few Wythe books which remain extant today.